Alexandros Lappas, a chemical physicist at the Institute of Electronic Structure and Laser (IESL) of the Foundation for Research and Technology-Hellas (FORTH), will be supported by the U.S. Office of Naval Research Global (ONRG) under their international Research Grants scheme to conduct interdisciplinary, basic scientific research in the area of magnetism and superconductivity. Dr Lappas’s distinction has been received after a competitive review of his proposal and recommendation by the Office of Naval Research (ONR) Science & Technology (S&T) Directorate. The associated 3-year grant is the only one of its kind that has been awarded to a principal investigator in Greece until now. As the U.S. government’s first permanent agency devoted to funding civilian scientific research during peacetime, ONR fosters scientific and technological innovations in a wide range of fields, while supporting blue sky research which renders significant scientific breakthroughs possible. The ONR’s broad role in competitive funding of meritorious research, across a spectrum of science and engineering disciplines recognizes Dr Lappas’s research for its overall scientific merit and its timely contribution to innovations of strategic importance. Dr. Lappas’s ONRG grant aims to elucidate exotic states where charge carriers move without electrical resistance (cf. superconductivity) through a terrain of interacting magnetic dipole moments. A surge of interest in this topic has been seen recently with the discovery of superconductivity in chemical compounds made of iron, a naturally occurring element found in a plethora of everyday applications. The research project, entitled “Deciphering the Workings of Molecule Intercalated Iron Chalcogenides”, will deliver new knowledge essential for achieving resistance-free flow of charge carriers through a material, the holy grail of efficiency in society’s grand challenges for green energy. The research effort aspires to motivate future practical applications that seek enhanced capabilities for electromagnetic spectrum control and/or improved power-saving in energy transmission and use. For the implementation of this research, Dr Lappas’s team will coordinate a cross-disciplinary network of European (FORTH, Greece & Warsaw University of Technology, Poland) and American (Brookhaven National Lab, NY & National High Magnetic Field Lab, FL) scientists. 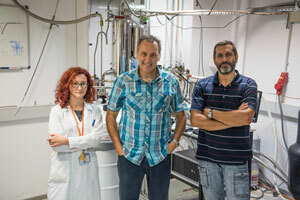 At IESL-FORTH, Dr. Lappas’s team focuses on the synthesis of functional, quantum complex inorganic (nano) materials by chemical methods and the investigation of their intertwined structural and electronic state evolution (FUN-L).